A little fairy planet to welcome a new born baby...Looking for new inspiration for new born...if only i knew how to sew properly ! This are the strawberry planets where you eat only jam and charlotte! I am working a lot around the strawberry theme! Put socks on little fairy ! I was starting to get on with my spring fairies, having already some flowers coming out in the garden, forgetting that we were only in january...and not in march ! But winter is coming : although i have a very nice fire (which takes ages to start in the morning, but that is cottage life!) I get cold feet ! Bye Bye spring fairies, where are my warm socks ? "Please don't eat me or you will break a tooth ! " This are the only fairy cakes i am able to bake, unfortunately they are for decoration purpose only, even if they appear to be full of sugar! This is my version of the charlotte fairy; tomorrow i will introduce you to the fairy cakes, the only ones i can bake are unfortunately not edible! - Very untypical weather we have at the moment in the north of France...And today the sun is shining as if the tulips were ready to come out ! This global warming is putting my inspiration into spring mode: no jack-the-frost-fairy this year then ! Another new year resolution will be to clean the fairy factory, it is not a nest but a mess! 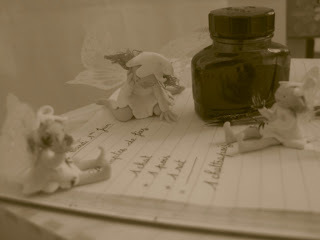 To start the new year iam starting a new blog, and my fairies too! Please bear with us because the fairies are clumsy and on top of that i am french ! Anyway, we wish you a warm welcome in our little fairyland...hope to see you again...new fairies coming soon after i have cooked them!